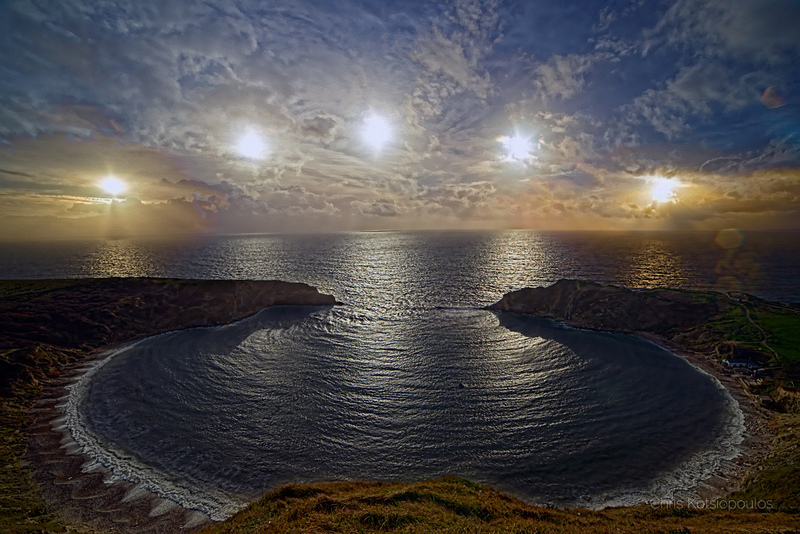 Explanation: A southern exposure and striking symmetry made Lulworth Cove, along the Jurassic Coast of England, planet Earth a beautiful setting during December's Solstice. Five frames in this dramatic composite view follow the lowest arc of the Sun, from sunrise to sunset, during the shortest day of the year. The solstice arc spans about 103 degrees at this northern latitude. Of course, erosion by wave action has produced the cove's remarkable shape in the coastal limestone layers. The cove's narrow entrance is responsible, creating a circular wave diffraction pattern. The wave pattern is made clearer by the low solstice Sun.